Here's an ad banner that packs a lot into a small space. 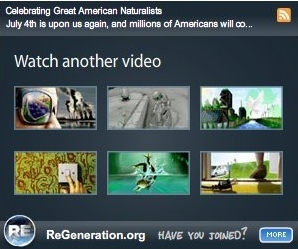 In tandem with the promotion of green energy site ReGeneration and it's tie in with the Dell Graffiti Facebook contest, Federated Media created an ad unit that incorporates a video player which shows the winning designs, rotating headlines from the ReGeneration site and a "more" button which delivers a slide up menu with options to share, subscribe, embed or download. It's a lot of functionality built into one banner but it works very nicely. After one of the design videos plays, the viewer is presented with thumbnails of the other winners which, if clicked, will play within the banner.